Being familiar with works from both of these artists, I was happy to see them doing a split together and curious as to the bands' respective directions. The Last Twilight's 'Morbid Path' EP was an inconsistent and confused work with patches of brilliant songwriting, while Profundis Tenebrarum's style of mystical, nocturnal black metal struck something of a chord in me after a few listens to their 'Hate Decade' demo compilation. I'm pleased to say that The Last Twilight has greatly improved on their formula while Profundis Tenebrarum is matching their older material easily in quality, and each side of this split is very worthwhile for the dedicated black metal fan. The four tracks which compose The Last Twilight's side of the split are an almost complete turnaround from the 'Morbid Path' EP. Where that piece was stylistically scattered and confused, on this work the band has found themselves a very precise style of fast, punk infused melodic black metal which manages to accentuate the best moments of the previous work with a newfound consistency and coherency in songwriting. Where the band previously suffered by having each track embody an almost completely different style of black metal, the style of this material is very concrete and coherent and an improvement on the previous work in nearly all ways while avoiding many of the pitfalls which plague this particular style of music. The Last Twilight's breed of riffy, melodic black metal is lightly brushed with punk, and this influence makes all the difference in the world. The uptempo and aggressive black metal style this band plays is significantly augmented for the better by a sneering punk sense of riffcraft, coming out very powerfully on tracks like 'Rising Under The Black Flame', which has a main riff that minus the tremolo wouldn't sound out of place on the first Offspring full-length! Surprisingly enough, these overtly upbeat moments don't damage the integrity of the music at all, and instead are ground intensely against the more misanthropic black metal elements to make for a strongly emotive and memorable breed of black metal. The riffcraft on this side is absolutely fantastic, and every track has at least one riff to bring to the table which will make you hum after the CD is done. On top of the greatly improved songwriting is a fantastically clear and full production job. A hundredfold improvement over the rather dry and flat production of 'Morbid Path', the sound on this material really helps to bring out the fire of these songs and chisel them directly into your brain. The savage and ripping yet clear guitar tone and full, throaty drums make for a great instrumental section while the searing vocals glide over the top smoothly and elegantly. The whole package is incredibly professional and this side stands as some of the best Spanish black metal I've ever heard. Somewhat more known artist Profundis Tenebrarum follows and doesn't disappoint at all with their breed of melodic and vast black metal. On this release the band actually treads closer to traditional Spanish black metal than before; 'Ascending From Cursed Domains' in particular reminds me of a more technically adept Primigenium. Despite this slight regression towards conventionality, plenty of the band's personality still shines through on these four tracks. The band's unique sense of dark and mystical melody is most certainly intact, with spellbinding yet ominous riffing dominating the soundscape under intense and throbbing vocals and drums. The relatively raw, misty production of these tracks really accentuates this band's particular style, crafting some of the most nocturnal and fantastical black metal this side of 'In The Nightside Eclipse'. The definitively melodic riffing is surprisingly technical at times, and every member is not just adept, but seemingly entranced by their own instrument. There's a focused intensity to this music which makes everything seem more exciting, as though the twists in the songwriting are abrupt physical turns which have a much greater than expected impact on the listener. Through this, the songs are kept interesting and captivating, and the individual technical performances provide another layer of interest for the dedicated listener. I'm probably not quite as great a fan of this Profundis Tenebrarum material as I am the 'Hate Decade' compilation; those early demos by the band are hard pressed for any black metal band to beat them in quality, so focused and natural are those tracks. The band's side on 'Hell Bestial Conjuration' certainly comes close though, and is probably aided by being of a certain different breed; while the tracks on 'Hate Decade' were somewhat more spontaneous and youthful in nature, the 'Hell Bestial Conjuration' material is a more mature and professional offering from the band, offering a different look at a similar style of artistry. 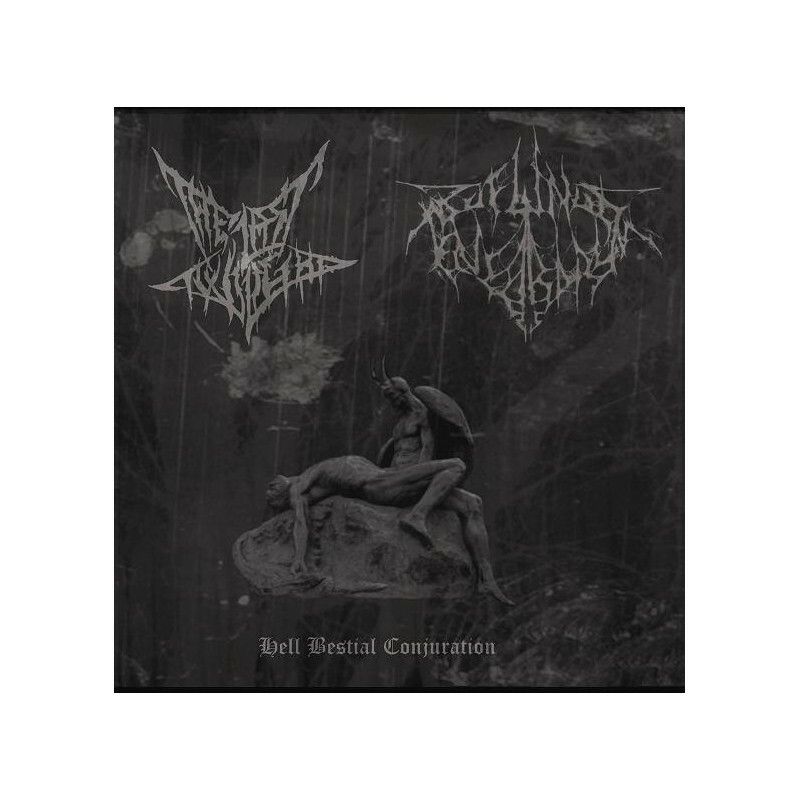 'Hell Bestial Conjuration' certainly stands as a great release in the generally lackluster Spanish black metal scene and offers a lot of hope for future releases by both the featured bands. Each artist brings something unique and quality to the table, and as such I can wholeheartedly recommend this CD to any underground black metal fan; no track goes even slightly awry, and on the whole this split can be easily considered a rousing success.